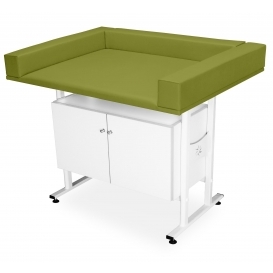 Baby nursing table combines comfort with high aesthetics. Table enclosed on three sides by foam, guarantees security for our small patients. Base of the table is powder coated. Table top is covered with high-quality upholstery, available in a wide range of colors. The table has a cabinet underneath the table top. Available colors of cabinet edges.